The Ontario Craft Brewers (OCB) are pleased to announce the establishment of an annual ‘Ontario Craft Beer Week’, a celebration of our province’s thriving, locally-based craft beer industry. The inaugural week will run from June 20 – 26, 2010, throughout the province of Ontario. 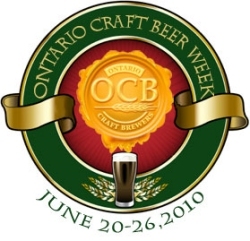 OCB is the association representing 25 small, independent craft brewers in Ontario. The week-long festival will feature a series of special events designed to expose consumers to the craft beer experience through tasting events, brewery tours, cooking demonstrations, food pairings, beer dinners, and much more. Ontario Craft Beer Week will kick off on Father’s Day with special events at breweries and restaurants. The Ontario Craft Beer Week organizing committee is in the process of setting up a formal procedure for securing partnerships and endorsing events and will release more information as it becomes available. Any interested parties with ideas or suggestions should contact their local brewery or send an email to info@ontariocraftbrewers.com with “Ontario Craft Beer Week” in the subject line. New details, when they are available, will be posted on the OCB’s new website for Craft Beer Week, www.ocbweek.ca. BEER CULTURE: Ontario has a thriving craft beer industry featuring over 25 independent craft brewers producing fresh, top quality beer. More consumers are choosing to support their local breweries and experiment with the incredible range of beer styles and tastes available. BEER TASTING: Fresh, Ontario craft beer is produced in small batches with lots of care and attention to detail. Using the brew master’s own authentic special recipes, craft beer is brewed using all natural, pure ingredients, and no additives or preservatives. Ontario Craft Beer Week will give consumers an opportunity to discover the world of Ontario Craft Beer through guided tastings, educational events, etc. BEER AND FOOD: Craft beer has a wonderful, complex flavour profile and is becoming increasingly popular in culinary circles as a recipe ingredient or food match. Chefs and restaurants will have an opportunity to entice customers by experimenting with tasting menus and specialty dishes. BEER TOURISM: With its rich brewing history and culture, Ontario is becoming an increasingly popular tourism destination for those interested in discovering craft beer, visiting local breweries, experiencing beer cuisine, etc. Ontario Craft Brewers: Discover the Difference. The Ontario Craft Brewers is an association of more than 25 small brewers dedicated to making great tasting, high quality beer in Ontario. The 25 members of the Ontario Craft Brewers brew their beers locally using fresh, all natural ingredients in communities throughout Ontario – from the Ottawa Valley to Waterloo and Niagara to Muskoka. Handcrafting over 150 premium beers, Ontario Craft Brewers employ about 600 people in Ontario, accounting for over 20 per cent of the overall brewing employment in the province. Ontario’s Craft Brewers’ share has more than doubled since 2002, going from slightly less than two per cent to approximately five per cent of the beer volume sold in Ontario and continues to be the fastest growing segment within the LCBO’s beer category. The OCB’s long term vision is to make Ontario a North American Centre of Excellence for Craft Brewing. Please discover responsibly.